J&R School Masterclass is opening its doors to anyone who has ever wanted to learn to cook in a friendly and fun way. Here at the drovers we offer all sorts of courses including vegetarian,game,meat,vegan,organic, healthy eating,sweets and desserts to working within a budget, menu planning and table layout. Our 1 day courses are for all ages and abilities. There really isn't a reason not to come along and enjoy the experience. Courses start with a welcome briefing to discuss the day’s activities over freshly brewed tea and coffee and homemade Welsh specialties. The fun starts as we enter the kitchen to create unique traditional dishes and modern influence using fresh ingredients supplied by ourselves, that meet your chosen requirements in a relaxed and informal manner. There will be tips and guidelines provided by friendly, professional chefs to build up to an end of course certificate for you take away with you. 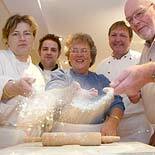 Whilst taking part in the cooking course we will be sipping wine and/or chatting informally throughout. We will break for lunch allowing you to taste some of the dishes you’ve created. After this tasty and relaxed respite we go back to the kitchen for some more creativity. We then break in the afternoon for freshly brewed tea and coffee and homemade cake to discuss the day’s activities. Let us take the strain off dinner parties by showing you quick and easy layout, menu planning—right through to the wine and coffee. These can also be Romantic Meals — Help set the mood with romantic cooking courses. New Ideas for every day cooking – Mid-week surprises, and workday treats – How to add flare, flavour to everyday cooking to surprise family and friends. Choose from ONE the courses listed below by entering the number of that course on the enclosed application form: All fresh ingredients supplied including knowledge of sourcing.